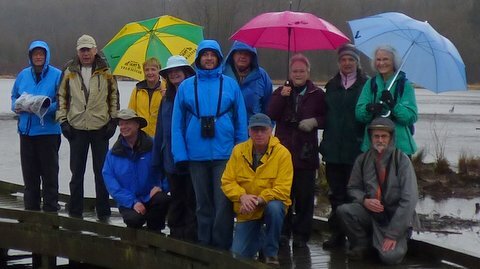 A few intrepid birders met up at the Burnaby Lake Nature House on this dreary morning. As we arrived from various locales, we jinxed ourselves by commenting on how warm and dry it was thus far. Eventually, we migrated out to the spit to do some birding. The usual suspects greeted us along the path including Black-Capped Chickadees, Song and Fox Sparrows, Red-Winged Blackbirds, and Spotted Towhees. Once we reached the shallows of the lake, a large raft of Mallards begged us for handouts. Being the kind-hearted and charitable folk that we are, we obliged them with fresh seed. Interspersed among the ducks were quite a few Wood Ducks and Green-winged Teals, with a handful of Canada Geese. They all busily ate the seed, honked, swam, and pecked at one another while we watched. A curious looking female Goldeneye stirred quite a bit of debate. It had an odd-coloured beak, and we speculated that perhaps it was a hybrid. (Later research proved otherwise). After feeding the ducks, we made our way to the end of the spit where we came upon a nice group of Long-billed Dowitchers pumping their needle beaks into the mud. At this point, a light drizzle started to fall and several umbrellas appeared. Finally, we got to work scanning the ducks on the lake and came across American Coots, a few Gadwalls by the reeds, all three species of Mergansers, a handful of Buffleheads, a group of Double-crested Cormorants preening on an overturned rowboat, a stray Northern Pintail, a great view of a Pied-billed Grebe, and a few Great Blue Herons. The highlight of the day was the couple of Ruddy Ducks swimming amongst the coots. At first we thought there was just one, but after searching for quite some time, we discerned four! We made our way back to the woods and started walking to the Dam. 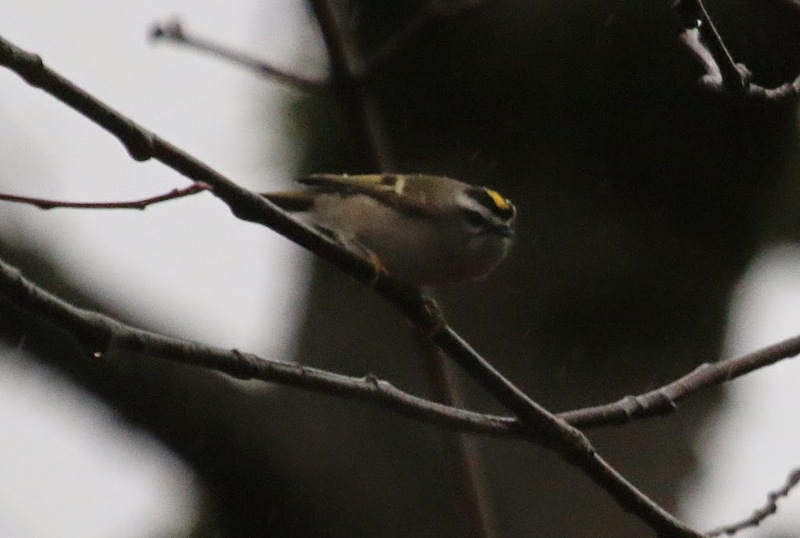 We saw a few Golden-crowned Kinglets and a Varied Thrush. Honestly, there were no other birds! As the drizzle turned into a full on downpour, someone commented that, “We could have stayed home and watched Chickadees and Varied Thrushes in our gardens.” We forged on. The rain got harder, the trail got wetter, and the birds got quieter. As we reached one of the forest loops, we made an executive decision to head back and drive to the dam to look for dippers. At the dam, we realized that the water level was extremely high and flowing with gusto. Our hopes of finding the dippers in the Brunette River dwindled. Despite the weather testing the “waterproofness” of our jackets, we were optimistic and agreed to check Silver Creek for our elusive bird. But alas, it, too, was not a peaceful creek, but a raging torrent. Blanking on birds, we admired the bouquet of Licorice Ferns growing on the deciduous trees. On our way back, we agreed that, as always, the company and conversations were quite enjoyable. We even admitted, begrudgingly, that birding on the point was pretty successful too. 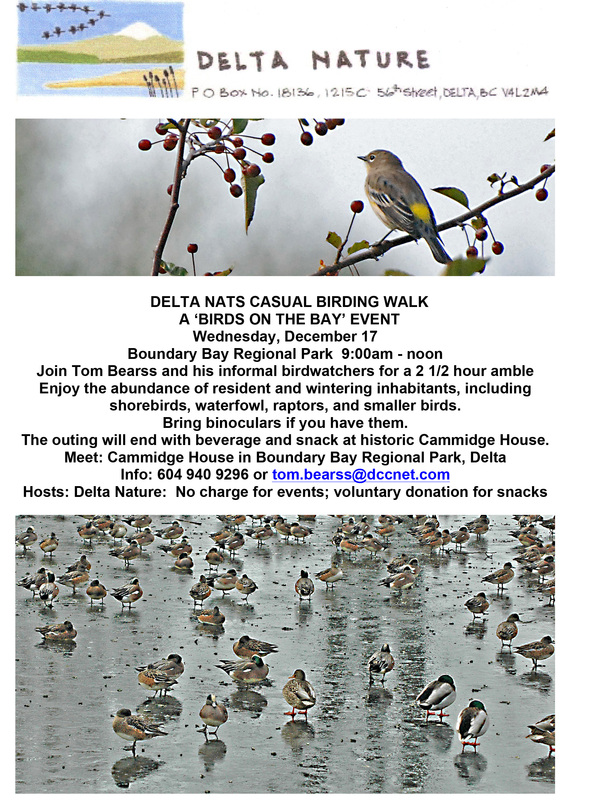 Next week, Wednesday December 17th, is the quarterly Birds on the Bay outing; meet at Cammidge House for 9 am start to Centennial Beach/Boundary Bay, returning to Cammidge House around 11:30 am for coffee & snacks. We might even see the return of the Australian Wandering Tattler Bearssbird. This entry was posted in *DNCB, Burnaby Lake, Long-billed Dowitcher. Bookmark the permalink.